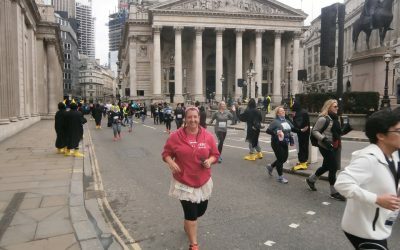 Another month another fabulous runner to showcase…and I got to hang out with her in the Pub on Sunday after the Winter Run which was pretty EPIC by the way. So I’d like to introduce you to the lovely and incredibly awesome Lou Stevens. When did you start running and why? I did not run a lot when I was younger, in fact very little at all, I used to cycle, and I have always danced but running was not my thing. I took part in my first event which was a Race For Life on 15th June 2014. According to my run keeper history my first training run was on 22nd May 2014. Race for life is such a good way to help raise awareness and I had a family member who was poorly, so it just made sense. What do you love and hate about the sport of running? Things I dislike about running because hate is such a strong word, the early race morning starts and the stupidly long toilet cues. The things I love, the feeling of accomplishment, the places you see and visit that you wouldn’t normally go to, the people that you meet, the bling (I mean who doesn’t) The alone time that you can have while on a run, and the way that you can just clear your head and forget about the real world for a while. 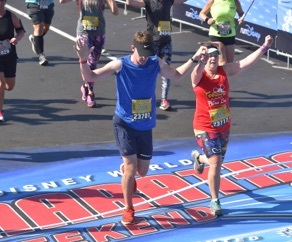 You can’t beat crossing the finish line with your nearest and dearest. I have some very special friends who I’ve meet at the start lines of races and still race with till this day. How often do you run? My current training plan (I’m training for Brighton Marathon) has me running four times a week but that doesn’t always happen, as we all know sometimes life just gets in the way. My shortest distance is normally 5km/3miles, I do a threshold run of about 5miles and then a long run at the end of the week, this weekend is 12 miles… fingers crossed. We know you recently took part in a Dopey, could you tell us about your experiences with training, motivation etc. 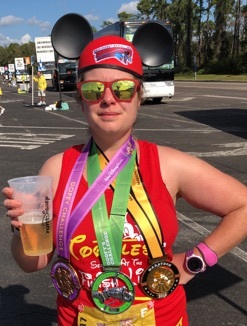 Dopey… it’s hard to even work out where to start, my training was lax to say the least but I knew my body coped well with multi-day running as I have done the 36km (5km, 10km & half) challenge at Disney Paris for the last two years running, but how the devil I was going to run a full on top of that I had no clue. Even on the plane flying over it hadn’t quite hit me what I was about to try and embark on, its wasn’t until we collected our race numbers that it all became real. The early morning starts I think was the hardest bit of the race weekend – the 3am alarm every morning Thursday – Sunday was killer, and we were tucked up in bed by 8pm to try and compensate. I mean who books a holiday that allows them to run 48.6 miles – apparently that would be me. I knew that the first three races should be a walk in the park, the time cut off is 16min miles (I normally run between 10/11) and I knew I could easily sustain that over the first three days, but I had no idea how I would cope during the full. The perks of a Disney race are that they have characters out on the course for you to stop and have photos taken with, someone had released a list of who was going to be at what points along the first 3 races and from that list I worked out who I “had to have” a photo with and I broke my race down from there, I didn’t focus on miles I focused on getting to Woody, or Sebastian, or Mary Poppin Penguins. They became my small respites, also helping me not to steam ahead to the finish line and reserving some energy for the days ahead. The morning of the full arrived and me and my partner had decided that we would only stop for a small number of photos due to the mammoth task ahead, I think there was 5 we agreed on. I somehow managed to run (other than photo stops) to the half way point. It was the hottest day of the whole trip so far (typical the day of the marathon) and I was starting to struggle, when we caught up with the 5:30hr pacer. All pacers at the event use the Geoff Galloway method (a method I have never tried before) and I fell into step with them doing a 30/30 ratio of run walk for the whole second half of the race. 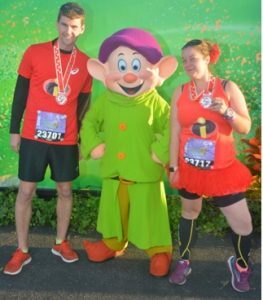 Somehow after 4 days of running I crossed the finish line of dopey in 5:27. There was tears, I had done something that in 2014 I never would have ever considered, and I did it with some of my besties in tow! Would I Dopey again, if you asked me when I crossed the finish line I’d say never again, now on reflection 100% yes, I best start saving. In September I’ll be back to Paris for the 36km challenge and to get me an extra special bit of bling for running from the castle to the chateau. 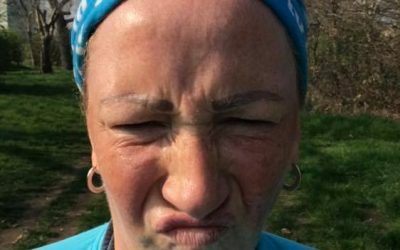 Have you had any negative experiences whilst out running? I had people jeering out of vans and kids sniggering as I have run past them, but I’ve been lucking in the fact nothing really untoward has happened to me. What is your ultimate running goal and what is stopping you from getting there? To start with it was to run a marathon, London to be precise. I have since run 4 marathons (London included) So post that it was time to up the ante. An ultra or a multi-day challenge was the next step. Which I have since achieved with Dopey. I guess next would have to be an ultra in terms of increasing mileage, but to be honest I’ve got my sights firmly set on trying to run a sub 5hr marathon. I’ve been close but just never quite pipped over that line. Liverpool 5:03, Bournemouth 5:13, London & Dopey 5:27. 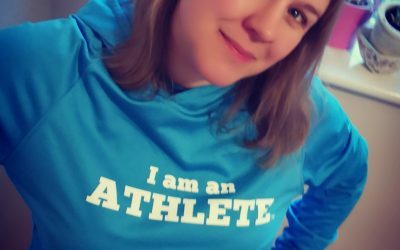 What could the government, local authorities, sports clubs etc do to encourage more people to take up running and sport, especially overweight and inactive women? Parkrun had played a big part in getting people active, the figures of new people each week prove that, I believe doctors are even prescribing it now, but more can always be done, The Clubhouse is proof of that, there’s a lot more groups on social media helping to promote getting out the door. What would you say to other runners just starting out? Stick at it and don’t quit just because the going has got a little tough. Speed is relative, and don’t measure yourself by someone else’s ruler. It will get easier, if everything was easy everyone would be doing it. Take your boundaries and push them, you’ll be surprised at what you can achieve. I have learned that I’m capable of more than I ever thought. The human body is incredible, and it really will let you push it to the limit. It’s true what they say you can learn a lot about yourself in 26.2 miles and so far, I’ve had 4 of those life lessons. How has being a member of the Clubhouse helped you in any way, if so how? 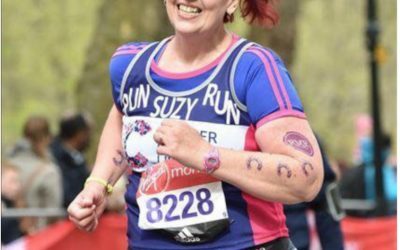 The ladies that I have met through the clubhouse are wonderful, some I have actually met in person like at the winter run last weekend and we all have a love of running to share. There are days when I really don’t want to run, and the clubhouse peeps send me motivation and away I go, and when I get back, I feel better for it. Were a community and we all support each other. If you would like to join our online community of awesome runners, check out The Clubhouse. 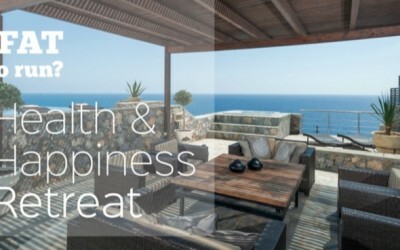 It is one of my greatest pleasures writing this blog to be able to showcase all of the brilliant women out there doing wonderful things. I love that these runners of the month posts normalize running in a range of body sizes and shapes.